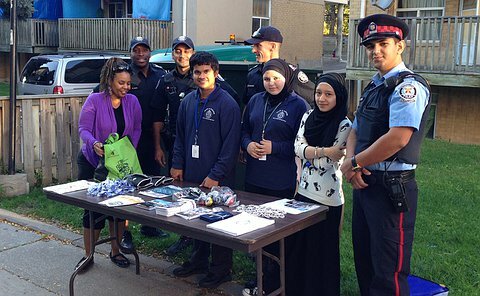 CRU officers at 55 Division and YIPI students along with Toronto Community Housing and Toronto Hydro came together to help light up 66 Walpole. 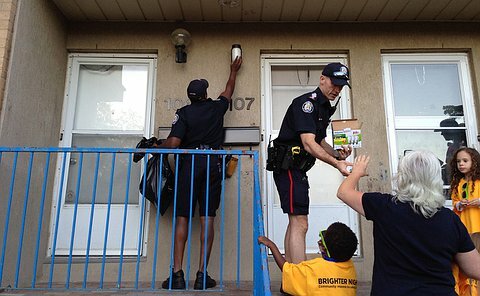 CRU officers from 55 Division install energy efficient light bulbs at the housing complex at 66 Walpole. In a joint community safety initiative with the residents of 66 Walpole, the lighting of the housing complex was improved by light bulbs donated by Toronto Hydro.The bulbs are energy efficient and were placed in the front and back areas of each resident’s house. 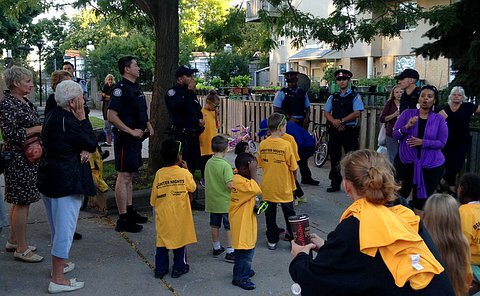 Officers from 55 Division conducted a safety walk around the housing complex and with the principles of Crime Prevention through Environmental Design (CPTED), and were able to identify areas of concern. These areas included front and rear windows and doors which allow people to see better around their homes and provide a greater sense of security. These lights also act as a deterrence for criminal activity as criminals lose the luxury of the cover of night. Once the problems areas were identified, Toronto Hydro offered to donate the cost efficient light bulbs, which are meant to be kept on all night. Thanks to the energy efficient bulbs, the cost of keeping them on all night will only be a few pennies.